I've really been enjoying avocados lately. Sure, I'll occasionally get one that's a MAJOR dud and fills my mouth with the flavor of moldy cheese smeared on a rotting deer carcass, but usually, they make for a fantastic dining experience. I feel like I should add in some tomatoes or roasted red peppers for a little color, no? When you get a good one, the flavor is subtly pleasant and the texture is creamy but a bit firm. When I find one like that, I like to eat it as simply as it comes, with just a sprinkle of salt and pepper. I also like them atop southwestern-themed salads and shmushed into guacamole. One of my favorite creations of late is a breakfast burrito involving cheese, eggs, avocados, and pesto. It's a salty, nutty extravaganza. What's your favorite way to eat these green gems? Do they make a paint the color of avocados? If so, are any of your walls adorned with it? Finally, have you ever purchased a large and seemingly meaty avocado only to find upon opening it that it's 85% pit? First, make your pesto: Combine the basil, garlic, and pine nuts in a food processor and pulse until coarsely chopped. Add 1/2 cup of the oil and process until fully incorporated and smooth. Season with salt and pepper. Add all the remaining oil and pulse until smooth. Transfer the pesto to a large serving bowl and mix in the cheese. Next, fire up a small saucepan and melt some butter in it. Add the eggs, then season and scramble them to your preferred degree of doneness. Add the cheese and stir it around until it melts. Remove from heat. Slather the pesto down the middle of the tortilla and then top that with the diced avocado. Dump on your cheesy egg mixture, and then roll it up tightly. Set the burrito, seam side down onto the hopefully still-hot saucepan to seal it up. Cut it in half and devour! Nice! I love avacodos. They are so versatile and delicious. I love avocados SO much! I admit, I pick up an avocado or two every single trip to the grocery store. One never knows when one will need one. Thankfully I have not run into the deer carcass variety. I heart avocado, they are so creamy and delicious...except when they have the flavor you so aptly described as rotting carcass LOL you crack me up Grace! This sounds like a delicious way to start the day. I do love avocado and your burrito sounds very yummy! Terrific for breakfast or lunch! lol, moldy cheese on a rotting deer carcass! Where did you come up with that Grace? That's the best laugh I've had for a few days. Seriously though, avocados are on my list of most purchased food items. I love your breakfast wrap made with pepper jack too. Yum! I also love avocado's & this tasty filled tortilla looks amazing, Grace! :) In my last post, I made lamb burgers & topped them with an avocado & yoghurt sauce! yummy too! Mmm, LOVE avocado! It's fantastic with eggs -- great recipe, Grace! I adore a good avocado but it is a crap shoot every time! great recipe! I didn't realize how long it's been since I've had an avocado until I saw this post....and now will not be able to rest until I have one sitting on my counter, ripening, and eventually in my belly. These wraps sound seriously awesome. 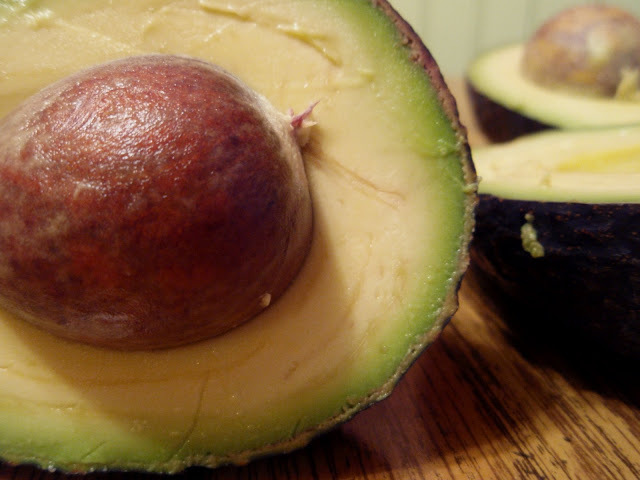 Avocado is one of my favorite foods....I eat them almost every day and this looks so creamy and delicious! I received a big, beautiful, perfect avocado in my CSA share this week. I love avocados! Your breakfast burrito looks fantastic. Next time, I'll be putting avocado in mine as well. What a visula of nasty avocado. Dang girl. Sorry I have been incomunicado. I am still having google issues. When my husband is not using his computer I am able to log into the google blogs and leave comments. Otherwise I am at read only status. My favorite way to eat avocado is in a very simple Barefoot Contessa recipe, an avocado and grapefruit salad. It takes about ten minutes to prepare and is absolutely wonderful! Mmmm deer carcass, a fine dining experience!! You are a hoot. Just had me some fresh avo today and it was perfect. But I know what you mean when they are LESS than perfect- ick!! I don't usually fool around with my Avocado but, you may have just changed my mind from typical Avocado eater to...A Cape Burrito! I love avocado with eggs...and this burrito with pesto and avocado looks delicious, like the color of this dish as well. I thought it looked tasty! I love avocados and quacamole is so popular in this little city on the prairies where I live. 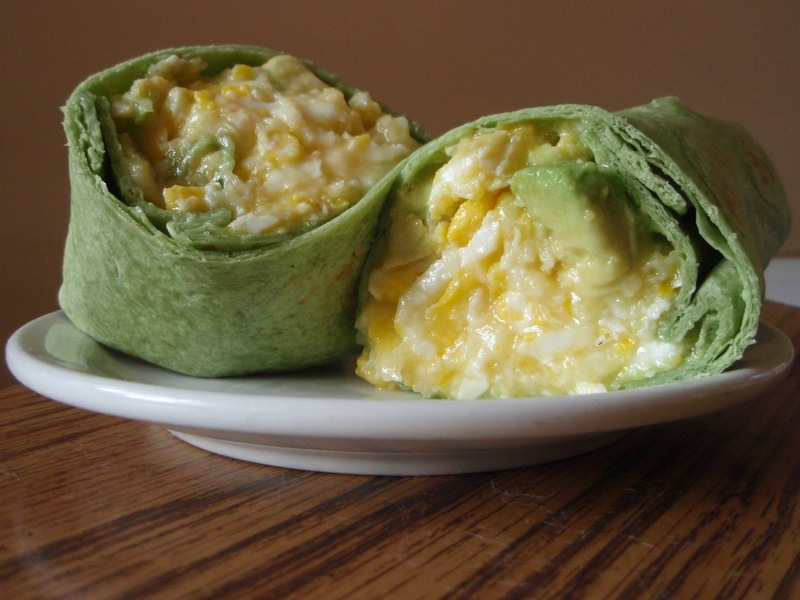 the wrap looks delicious just the way it is -this coming from a big egg fanatic! perfectly cooked scrambled eggs, makes me want breakfast in the middle of the night! Oh! and I generally eat them mashed with cream cheese and a little black pepper, inside a pitta or on seeded brown toast. I love avocados! Lately I've just been making avocado toast, or sometimes with a slice of mozzarella on top. But scrambled eggs, avocado, and pesto sounds delicious, I will try it next time! I love avocados, and that burrito there has my tummy grumbling!! That's a super looking burrito, Grace. I love them in salads, but never tried one in an egg salad. Clever girl! Oh yum, I love avocados. Although I must say I have never had a deer carcass-y one before. Usually my dud finds are the ones that too many people have squeezed and it's blackened on the inside. The breakfast burrito sounds awesome. And filling! I love avocadoes with eggs! Yum. You must not have grown up in the 70s or 60s, or you'd remember the avocado paint and avocado kitchen appliances! Anyway, I like them plain, in guac, on sandwiches, with any Mexican food...I could eat them any which way. Don't ruin a good thing with tomatoes...looks great just as is. I love avos - smashed onto sourdough toast with a sprinkle of tabasco is my favourite. Looks great! We are serious avocado lovers in our house! Yep, they are my favorite!!! I will eat them in any form!!! !